Local artist, educator and owner of the Scotts Valley art studio, Drawn2Art, Rachael Cartwright was the guest for Artists on Art, May 10, 2011. Rachael came on to the show to talk about and promote two events happening this May 14 and May 15 weekend, in Scotts Valley, to benefit the Bryan Stow Fund. All the money raised will be donated to this Fund for Bryan’s care who had been brutally beaten at a Dodgers/Giants Opening game in San Diego, March 31, 2011. Bryan has yet to regain consciousness. His family lives locally. On Saturday, May 14 from 1:00-4:00 p.m., the Kings Village Shopping Center will be transformed into a kid inspired playland. There will be live performances, an obstacle course, a bouncy house, face painting, an Art Show and more for kids of all ages. American Medical Response (AMR) will be there with an ambulance and invites families to stop by and take an-up close look. 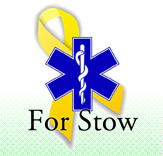 Various vendors will set up booths with merchandise, jewelry, food, “For Stow” t-shirts and more. At 3PM a hosted live auction & raffle will take place with prizes from many local businesses and organizations. On Sunday, May 15 the Scotts Valley Grand Prix Returns is being held at Canepa Design, located at 4900 Scotts Valley Drive, from 1:00-9:00 p.m. Mark Davis, CEO of Syzygy Sports Group has put together a whole day of fun for the family. There will be bike races and Drawn2Art activities for the kids, a raffle, vendors, a food court, race announcers, DJ’s, a podium presentation stage and a children’s play area that will include a bouncy house, climbing wall and more. Along with the supporting Bryan’s medical costs, this event was created to bring more women into mountain biking. Bring the whole family for a community weekend full of fun activities, entertainment and for the opportunity to contribute to a very worthy cause for one of Scotts Valley’s own! If you missed any part of the live broadcast, please click on the triangle below to hear the show. These events are being organized, Rachael Cartwright, in conjunction with the Kings Village Shopping Center Businesses, and Mark Davis, CEO of Syzygy Sports Group. Monies raised from these fundraisers will be donated to help defray rising medical costs and support Bryan and his family. For more information, please contact: 831-439-9233. Rachael is the Owner and Director of Drawn2Art/KidsArt Studio in Scotts Valley. She has been a lifelong artist practically from birth and began teaching at the tender age of 16 in KidsArt. Through the curriculum and program, she takes a very classical approach to teaching drawing and painting that is instruction coupled with practice in a step-by-step approach that builds on a foundation.